Combining map-guided trail navigation with 2-way radio communication, the Garmin Rino 750 handheld brings a whole new level of confidence to your outdoor adventures. It features a dual GPS and GLONASS satellite reception, Active Weather updates, emergency alerts with Position Reporting, Bluetooth® headset audio, 3-axis compass, barometric altimeter and more. Rino 750 supports advanced mapping capabilities such as BirdsEye Satellite Imagery (subscription required). Each Rino series device features a dual-orientation, 3-inch color touchscreen that’s glove friendly and easy to read, even in bright sunlight. A powerful 2-way radio transceiver lets you easily stay in touch with your fellow hunters, hikers or explorers in the field. You also have capability to send unit-to-unit text messages to other Rino users in your area — ideal for loud or windy conditions or when you don't want to disturb the wildlife. Rino also lets you share your waypoints, tracks, routes and geocaches wirelessly with other compatible Garmin handheld devices. Rino series handhelds feature a unique Position Reporting capability that lets you send your exact location to other Rino users so they can see it on their map page. With its high-sensitivity GPS and GLONASS receiver and quad helix antenna, Rino 750 quickly finds your position and maintains it — even in heavy cover or remote, off-the-grid locations. 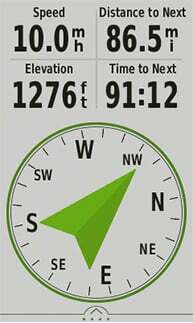 Plus, a built-in barometric altimeter and 3-axis compass make it easy to get your bearings without needing to hold the unit level. Rino 750 handheld comes with a worldwide, shaded-relief basemap. With the wide array of detailed Garmin marine and road maps available, it’s easy to install additional mapping products. Just use the unit’s microSD™ card slot to load the compatible mapping options you want. Or you can use our free Custom Maps software to transform paper and electronic maps into downloadable maps for your device. 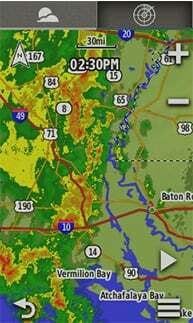 With support for Active Weather forecasts and animated radar tracking, the Rino 700 series gives you a vital edge in weather awareness. 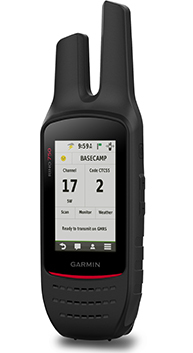 Get real-time conditions, forecasts and alerts (in areas with coverage) directly on your handheld display when the Rino is paired with a compatible smartphone¹ and the Garmin Connect™ Mobile app. Syncing your Rino with a compatible Bluetooth-enabled headset enhances your radio communications, even under adverse weather or wind conditions. And by syncing your Rino with a compatible smartphone¹, you receive smart notifications (calls, texts, emails and more) right on your display, so you stay focused on the trail ahead while staying connected with friends and family back home. Durable and water-rated to IPX7, the Rino 750 is built to keep delivering vital mapping and tracking data, no matter what the elements throw at you. Battery life can exceed 14 hours in the field. Plus, the dual battery system lets you use the included rechargeable lithium-ion power pack or AA battery pack (sold separately). Take charge of your next adventure with BaseCamp™, software that lets you view and organize maps, waypoints, routes and tracks. 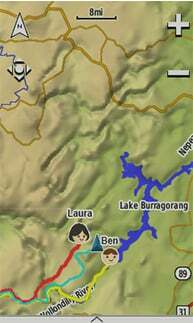 This free trip-planning software even allows you to create Garmin Adventuresthat you can share with friends, family or fellow explorers. BaseCamp displays topographic map data on your computer screen, including contour lines and elevation profiles. It can also transfer an unlimited amount of satellite images to your device when paired with a BirdsEye Satellite Imagery subscription. Garmin BaseStation lets you turn your laptop (loaded with BaseCamp) into a field command center for tracking multiple Rino units. View real-time GPS information on the larger display of your computer while Rino serves as a router/antenna. And because it’s Garmin GPS-based, you're in control of more effective search and rescue operations, even when internet or cell phone service isn’t available.